Jim gets a letter containing bad news. Jim tells Glen that the letter is from Lucy's school - Arlingwood College. Apparently Lucy hasn't been applying herself and they're threatening to withdraw her scholarship. Jim says he'd better drive up to Arlingwood to find out what's going on. Glen offers to go along, but Jim says he'd better have a talk to Lucy about Glen's status as her half-brother first - it's better if he talks to her face-to-face and this will be his first opportunity. Cody is in a bad mood and snaps at Pam for moving some of her books on the table. Pam is studying her nursing material and tells Doug that there's so much to learn - so much more new technology these days. Pam also tells Doug that they're going to have to go through the budget after dinner. Todd comes in and Cody ignores him. Apparently she's got it into her head that Todd was going out with a barman's daughter while he was on the run. Todd insists he didn't cheat on her - why would he have mentioned this Belinda if he had been?! He could just have stayed quiet. Josh is winding Cody up about Belinda, saying that Todd has invited her down for a visit(!) Todd and Melissa roll their eyes. Todd tells them that he's struggling with his school-work and they promise to help him catch up. They arrange to meet at the Willis house after school. Glen gets out of the shower to answer the phone. It's Arlingwood College - telling the family that Lucy has done a bunk. As he puts the phone down, the door opens and a girl with a strange face come in - it's Lucy Robinson Mark III! She wonders who Glen is and why he's wandering around the house wearing nothing but a towel. She flirts with him a bit and tells him that she's soon have Jim wrapped around her little finger. Glen is playing his guitar when Lucy comes out of her room. She asks him why he's staying with them and Glen tells her that his mum died a couple of months ago. LUCY: My mum died too. I was only a baby. Dad's always talked about her so much, it's like I remember the great person she was. What about your father? Where is he? 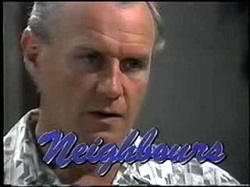 He changes the subject and tells Lucy that Helen will be home tomorrow. Lucy tells him that Helen is always taking kids in and treating them as part of the family. GLEN: It's nice to feel welcome. LUCY: Well, you are, believe me. Pam tells Doug that they have to do some serious economising, like taking prepared lunches to work and school and stop giving Cody handouts constantly. Cody comes in and asks Doug to buy her an outfit for a party next week and Pam vetoes it. She tells her that things are very tight at the moment, and besides, Cody already has a lot of nice dresses in her wardrobe. Cody freaks out and tells them they're "wrecking her entire life". Glen is tinkering with Bertha while Lucy hangs around chatting to him. She asks Glen to take her for a ride sometime. LUCY: I'm definitely the Porsche kind of girl, but for you, I'll make an exception. Lucy calls over to Todd who is coming up the street with Melissa. He's pleased to see her and races over to give her a hug. Melissa is not amused and walks off. Todd and Lucy are making sandwiches and catching up. Lucy goes to the front door and Cody immediately starts laying in to her about stealing boyfriends. Todd tells her to calm down, but Cody tells Lucy to rack off and tells her to stay away from Todd. Lucy tells her she's not Belinda - she's Lucy Robinson and she's not interested in Todd. LUCY: He told me he had a girlfriend, but he didn't say she was a mental case! Cody is very embarrassed and stalks out. Cody is ranting at Todd about Lucy. CODY: How dare she talk to me like that? MELISSA: She talked the same way you did! Todd explains that Lucy has run away from school, and she's quite nice when you get to know her. He also tells Cody that Belinda is not worth worrying about and they should forget about it and get some study done. He's quite masterful and Cody meekly agrees. MELISSA:(to Todd) How did you do that? Lucy and Glen are having a chat and Lucy says she prefers older men. Jim comes in and Lucy hugs him. He tells her Helen will be back in the morning, she can say hello and then go back to Arlingwood. Lucy doesn't want to go to Arlingwood anymore - she'd rather live at home and go to Arlingwood College. Jim isn't pleased but reluctantly agrees to talk it over with her. When Lucy has gone into the kitchen, Glen says that Jim had better tell Lucy about their family relationship. Todd and Josh are studying while the girls are off doing something in Cody's room. They decide to pop back to No.26 to pick up a maths book. Pam is looking at the budget again and tells Doug that he'll have to put his prices up because he can't cover costs. It's either that or lay somebody off. Doug can't do that - some of them have been subcontracting for him for years. DOUG: There's got to be another way out of this mess. Glen and Jim are sitting at the kitchen table and Lucy is cooking. Todd and Josh come in and Todd introduces Josh to Lucy. JOSH: So you just arrived this afternoon, hey? I guess it must be a bit strange for you, meeting all these new people. LUCY: Yeah, well, Todd's girlfriend's a bit of a worry! JOSH: What I meant was, finding out you've got a brother that you never even met before. TODD: Brilliant, one Josh. Noone's told her yet. LUCY: Dad, what's he on about? Jim asks everyone to leave the room. LUCY: What's this business about a new brother, Dad?